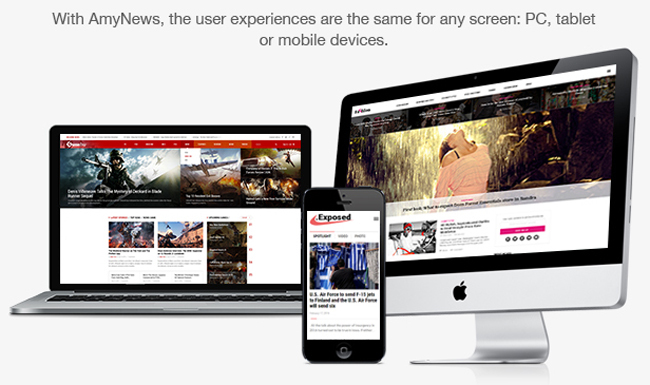 AmyNews is a premium responsive WordPress theme for online news and magazine sites. It’s designed for Fashion, Sport, Game. AmyNews is user-friendly, customizable with modern design; neat, clean layouts & fonts. Easy installation and powerful settings are all you need to build excellent websites. – 3 nice Header styles and ten Footer Styles give you more choices to build up your nice web pages. – You can select the number of footer columns or its layout by just one click. – Unlimited skin color for your web page to fit its content. – Show/ hide Search and Login/ Logout module on the main menu. – There are two layouts for Blog page: Grid & List layouts. – Show related posts based on the categories or tags.